Comments: Much of the matrix is the gray metallic paakkonenite with red crystals of kermesite and minute yellow crystals of valentinite. Location: Cai' ao mine, Danfong Co., Shaanxi Prov., China. Scale: 3x2x2cm. Comments: A mosaic of large grains of a low-Cu bismuthinite derivative, decomposed into an intergrowth of paarite (bd42) and krupkaite (bd49). Location: In quartz veins of the Felbertal scheelite deposit, Salzburg Province, Austria. (CanMin v43:909). Scale: See Image. Comments: Pabstite grains in matrix. It is essentially the tin analog of benitoite with tin replacing titanium in the formula 3:1. Pabstite fluoresces under SW UV light as seen in the photo. Location: Kalkar Quarry, Santa Cruz County, California, USA. Scale: 4.5 x 3 cm. Comments: Color-zoned (darker core) prismatic translucent pachnolite crystals, with secondary white prismatic microcrystals. Location: Ivigtut, Greenland. Scale: See Photo. 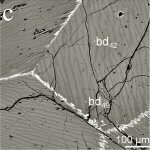 Comments: Scanning electron microscope photomicrograph of blocky subhedral to euhedral crystals of paganoite and more fine-grained mottled material that is aerugite. (Eur. J. Mineral, 13:169). Location: Johanngeorgenstadt, Saxony, Germany, mined in the mid-1800’s, nothing was preserved of its previous history until it was located in 1981 by the American mineral dealer David New in the back of a drawer in an old mineral shop in Germany.. Scale: See Image. Comments: Lilac colored pahasapaite in matrix. Location: Tip Top Mine, Fourmile, Custer District, Custer Co., South Dakota, USA. Scale: Picture size 3.5 mm. Comments: Painite #12, is an orange-brown, 0.156 gram, transparent, uniaxial, gemmy crystal with one perfect termination. Location: Ongaing village, Mogok region, Myanmar. Scale: Not Given. Comments: Pink crystals of pakhomovskyite on the matrix. (CanMin, v44:117). Location: Dolomite carbonatite cutting phoscorites in the Iron-Ore Complex, Kovdor, Kola Peninsula, Russia. Scale: See Image. Comments: SEM image of crystals of pakhomovskyite on the matrix. (CanMin, v44:117). Comments: Polished Section (PPL) showing light gray euhedral palarstanide (P) surrounded by white atokite (A) in light brownish cubanite (C). Location: Talnakh, Ural, Russia. Scale: Picture Size 0.14 mm. Location: Molinello Mine, Val Graveglia, Liguria, Italy. Scale: Picture size 4.5 mm. Comments: Platinum-rich palladium nugget, mounted in epoxy, with one side polished. Location: Itabira, Minas Gerais, Brazil. Scale: See Photo. Comments: SEM polished section showing hessite (Hes) with merenskyite (Mrk) relics surrounded by palladoarsenide (PdAs). (CanMin, v43:1355). Location: Elatsite porphyry-copper deposit, Bulgaria. Scale: Scale Bar 10 µm. Comments: Palladodymite (light gray, in two small grains), hongshiite (pale creamy grayish, tarnished brownish) in massive ruthenium. Polished section (from microprobe analysis) in reflected light. Location: Miass River, Zlatoust, Ilmen Mts, Chelyabinsk Oblast', Urals Region, Russia. Scale: Picture size 0.09 mm. Comments: Irregular metallic palladseite grain. Location: Senton, Devon, England. Scale: See Photo. Comments: BSE image of octahedral panichiite crystals on alunite. (CanMin, v47:367). Location: La Fossa crater, Vulcano, Aeolian Islands, Italy. Scale: See Image. Comments: Translucent colorless panunzite crystals lining a small cavity in greenish volcanic matrix. Location: Valle de Diablo, Somma-Vesuvius Complex, Campania, Italy (Type Locality for Panunzite). Scale: Crystal Size 1-1.5 mm.